Many have kept asking themselves if it is possible for the disabled to undertake a gorilla trekking safari on their Uganda safari! The answer is; it is possible! Gorilla trekking or tracking no matter what you are familiar with is the top Africa safari activity done by travelers visiting Uganda, Rwanda and Congo. It in fact tops the lists of what to see and do before you die. Being popular, Mountain Gorilla trekking isn’t no ordinary activity, it’s a great experience, so rewarding and worth spending your cents on. Limitations always come the way and frustrate some of those who would love to go trekking. Mountain Gorillas only exist in their natural habitat ranging on an altitude of 1,190 – 4,507, a reasonably high place that requires hiking (even revealed in their name). The gorillas reside in Bwindi Impenetrable National Park and Mgahinga Gorilla National Park in Uganda. In Rwanda, they are found in Virunga National Park and in Volcanoes National Park in the Democratic Republic of Congo. All within the same proximity, the only way of getting up close to the great apes is by going for a Uganda gorilla trekking safari tour. Gorilla trekking can be a strenuous activity on the hike through the thick forest in search of the gorillas lasting about 4 to 6 hours just to spend 1 hour with the gentle giants. With this altitude many tour operators will discourage the physically disabled, elderly and those with joint problems to go trekking. However, gorilla trekking for many is a dream come true therefore, a special needs gorilla trekking safari in Uganda or Rwanda can be organized. 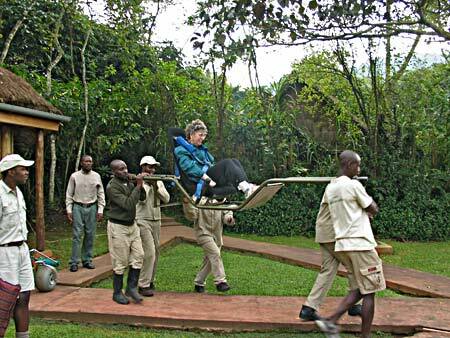 How do the disabled go gorilla trekking? For a special needs gorilla trekking safari, a traditional bamboo stretcher-like carrier (made with ease to maneuver in the forest), or the creatively built steel-base, sedan chairs with seat belts and handles is used to ferry trekkers through the forest. The sedan chair is made up of metal poles with a seat slugging between them. The bamboo stretchers are made of bamboo trees, the common tree species in gorilla habits. The trekker has the chance to choose between a trencher or a sedan chair. Sedan chairs are borrowed from the park headquarters and the cost of carrying a trekker is roughly 300USD though determined by the distance, terrain and weight of the client. Four porters carry the client from each corner of the chair. Gorilla trekking starts with a briefing from the park rangers at 8:00am lasting about 30 minutes. After briefing and allocation of a gorilla family to trek, the porters carry the individual to the jungle alongside the other 7 trekkers and park rangers. After meeting mountain gorillas, the client is put down for clear photography and gorilla filming. 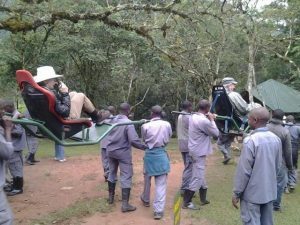 As with sedan chairs, a traveler sits in these stretchers and four porters carry him/her to and from seeing mountain gorillas. A mountain Gorilla trekking permit in Uganda costs USD 600 and the Rwanda gorilla trekking safari permit costs USD 1500. These are exclusive of the Sedan chair and porter fees, therefore plan all the fees before getting to the park. Prices are unpredictable and can be fixed at the time of the trek but roughly a total of USD 300 can be spent. Book early to guarantee the availability of the chair on your trekking date. A Uganda gorilla trekking safari or that of Rwanda takes the same time no matter the ability of the person. The whole group treks at the same pace and surprisingly any trek can undertake the activity and appreciated by those who choose our popular gorilla safaris Uganda. The Uganda gorilla safari can be tailored with other Uganda or Rwanda safari activities to make the experience more memorable.